We are going to present fresh visualization of plant design simpler, quicker and with superior quality. 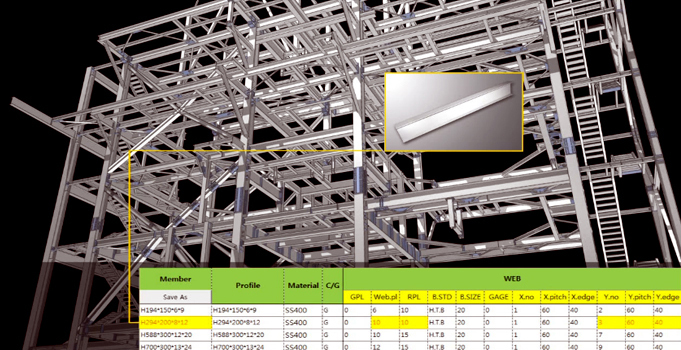 DS Component develops customer's business effectiveness significantly using artificial intelligence connection automation software which is based on TEKLA STRUCTURES. DS Component contains 14 modules. Base plate component builds hinged-base plate connection and post connection. Moment components are used on both column splice connection and on two column splice connections of various sizes. DS componenet has the ability to join various end-plate connections. Shear component can be used on single shear connection and double shear connection. Brace component is used for single shear bracing connection, double shear bracing connection and splice bracing connection. Last but not the least; it is also able to join Girth and Purlin connection. DS Component is user friendly software which uses user's own database to construct a variety of member connection data, which creates an easy and accurate design possible. Counting on member sizes, connection is built automatically, and since connected to various member sizes, an easy and fast modeling is possible.